I've been holding off getting any kind of treatment since I gave birth. With the heat and how difficult it would be to care for a new do, I thought that I'd be better off with just my ho-hum hair style and it being in a ponytail. I wanted less fuss. I have too much on hands already and I really couldn't be bothered. Just thinking of the hair-maintenance of rebonded or permed hair already makes me feel so tired. Yet I could already feel the lure of a much-needed time at the salon. My hair is frizzy to no end, unimaginably unmanageable and it's drier than ever. Suffice to say my hair needs a major makeover and what Vivere Salon is exactly the answer I've been looking for. 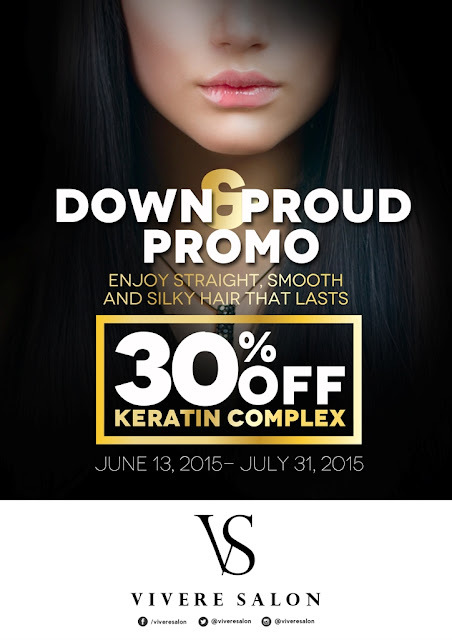 They currently have on 30% off promo their Keratin Complex treatment. It's the kind of treatment I've been looking for because no chemicals are used in this process and it doesn't need a lot of maintenance from my end. What it does is revive the hair using natural Green Kerating from from soy beans, corn and wheat, it combines nutrients such as protein, calcium, fiber, potassium and iron to hydrate and boost the hair and scalp’s health and in turn. And it didn't take a long time, too, so easier for me to make more plans for the rest of the day. The process of the Keratin Complex Treatment is very simple. A gently shampooing using a Keratin shampoo is used to cleanse the hair of any product. After which the hair is blown dry and stylist detangles the hair in preparation of the application of the Keratin treatment (which is exlusively amde n Brazil!). Application of the treatment is per section from roots to tip. The hair is then cellophaned to seal the treatment and the stylist will leave it on for a good 20 to 30 minutes and it will be rinsed off. Stylist will then blow dry again the hair and to seal in and infuse the treatment, heat is applied using a flat iron. And that's it! After around an hour and half, I was done! Keratin Complex relaxes the strands of the hair without use of any chemical straightening than can further damage the hair. It provides a silkier, smoother finish and the hair is definitely more manageable! I have achieved exatly what I want for my hair, the volume and the softness that rebond or permed can't give. It's really is a miracle as dubbed by many who have tried this treatment before me. I used to get rebond every year and then got my hair digipermed and hair coloring in between. My hair had its fair share of being abused for sure. It was only when I got pregnant and then gave birth that I appreciated a hair that is not a slave to these chemical treatments. I saw and loved my hair's natural volume and how having thickness isn't so bad. I decided then to avoid harsh chemical treatments to tame my hair. I'm quite happy that there's a Keratin Complex treatment that addresses my concerns and still give me fanstastic natural-looking results.If that's not worth paying for, I don't know know what is! What I love about Keratin Complex? Mt hair treatment costs Php7000 but with the 30% off, it's now only Php4900. So if you're looking for the same kind of results as I am, better visit the nearest Vivere Salon and take advatage of their Keratin Complex at 30% off! My hair is pretty damaged from bleaching and dyeing. The strands are thin and stretchy esp when wet. I want to get this done. but I think it's a bit pricey. I want to know if it's a real worth of money. How long did it last on your hair? Did the frizziness go away?